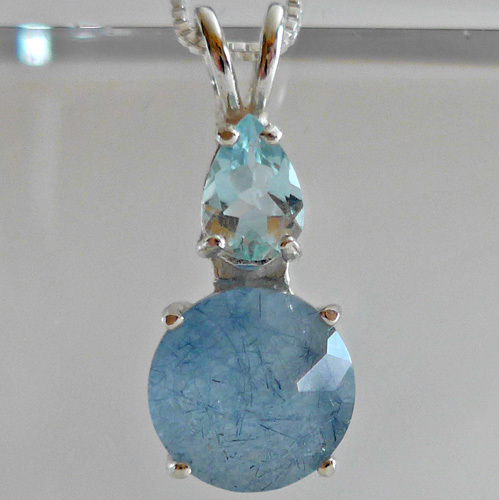 Dimensions (HxWxD): 0.9" x 0.375" x 0.375"
This stunning new combination from our jeweler has a lovely Blue Quartz Mini Radiant Heart Pendant crowned with a luminous teardrop shaped Aquamarine Gemstone. These stones will reinforce our ability to communicate and to connect with Higher Source. 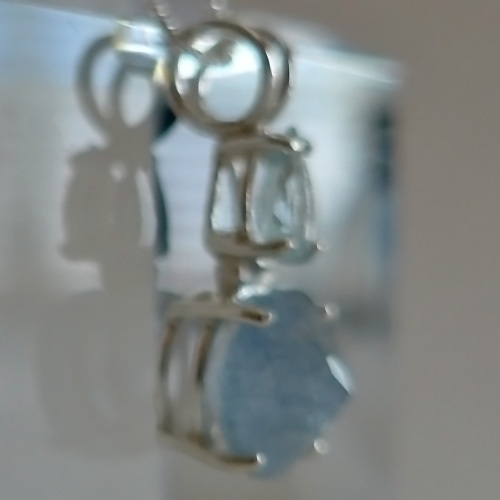 These stones are set into a sterling silver setting which allows the stones to breath, and hangs on its sterling silver chain right on the thymus between the throat and the heart chakras, offering protection to the whole body resonating through the compassionate heart. This pendant comes in its own velvet jewelry box for safe-keeping. Rare blue tourmalinated quartz, known as indicolite, also called Blue Quartz, contains long, thin prismatic crystalline formations of deep blue tourmaline. This crystal comes from Brazil, where it is available from the source in very limited quantities. Indicolite, or blue tourmaline, is an extremely hard complex silicate of boron and aluminum, with powerful piezoelectric properties. This means that indicolite crystals generate electricity when subjected to mechanical stress and pressure. Jane and I are impressed by the powerful healing energy generated by deep blue indicolite quartz. Simply hold this deep blue quartz in your hand or wear the pendant during meditation, and feel the flow of peace and stillness spread throughout your aura, facilitating the cessation of mental chatter and the complete relaxation of the body. Or use this powerful deep blue crystal pendant as a tool to radiate peaceful, healing energy throughout your immediate environment. Tourmaline possesses the property of omni-directional energetic radiation, so there is no need to consciously direct the flow of energy in any particular direction. Jane and I have also used deep blue tourmalinated quartz in Reiki sessions and found that it imparts a feeling of profound protection, deep relaxation and reverential quietude to clients seeking healing. It is a wonderful tool for people to use for help in speaking up, speaking their truth and communications in general. Lightworkers & meditators will appreciate the qualities of this wearing this stone to facilitate mental acuity and energize the individual with the courage to speak their own truth filtered through the wisdom of the heart. We often recommend that our Reiki and past life therapy clients wear crystals or gemstones for protection to assist in working on all of one's bodies: physical, mental and emotional. To learn more about how to protect yourself from negative energies read our article Psychic Self Defense. Note: Weight above is shipping weight. Actual Weight is .15 oz. Each piece is unique and may vary slightly in appearance or coloration. Each piece is guaranteed to be beautiful and to meet with your complete satisfaction!